Think of your favorite recipe. The one you’ve made for years. 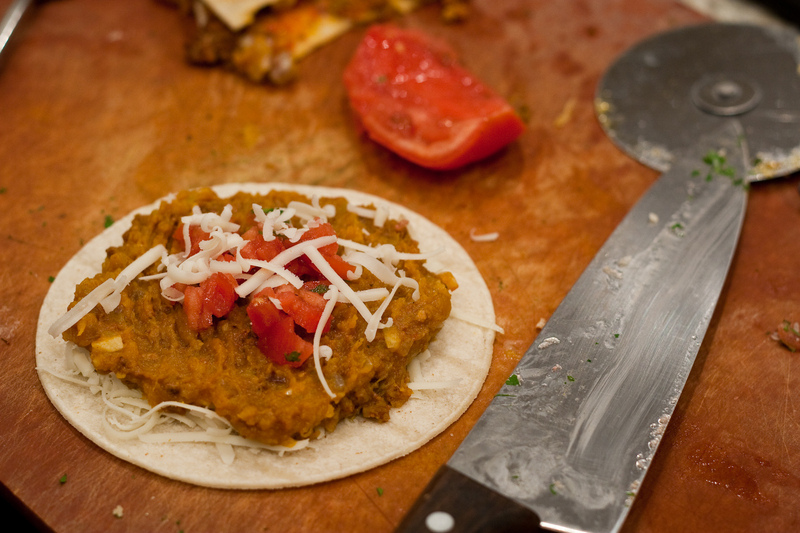 It’s flavors are burned on your tastebuds. You can recreate it from sense memory. Go into your kitchen and prepare it, writing down each step and each ingredient. Grab the cookbook off the shelf and let it fall open it to the familiar, splattered and stained page. Even the recipes we know best change over time as our palates and our dinner partners, the markets we shop from and the popularity of ingredients evolves. Bland canned tomatoes give way to San Marzanos, or fresh stewed. Cayenne is replaced with smoky chipotle, ancho or complex Piment d’Espelette. Children demand simpler flavors, new boyfriends or wives shape your meals with their own experiences and preferences. One year ago I served up sausage and pumpkin quesadillas. 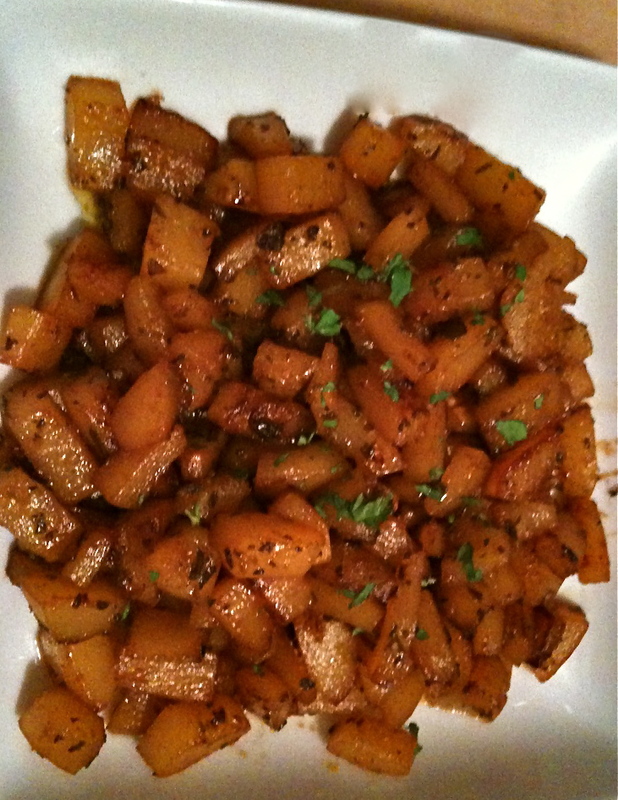 This year the heavy blend of cumin, chile powder and Spanish paprika overpowered the sweet hearty Hubbard squash. Chopped tomato brightened the rich flavors with sweetness and acidity. Savory andouille sausage was replaced with equally spicy but less earthy Mexican chorizo. Change isn’t always good or bad. Sometimes it’s just different. Fortunately in the kitchen, it’s usually delicious. 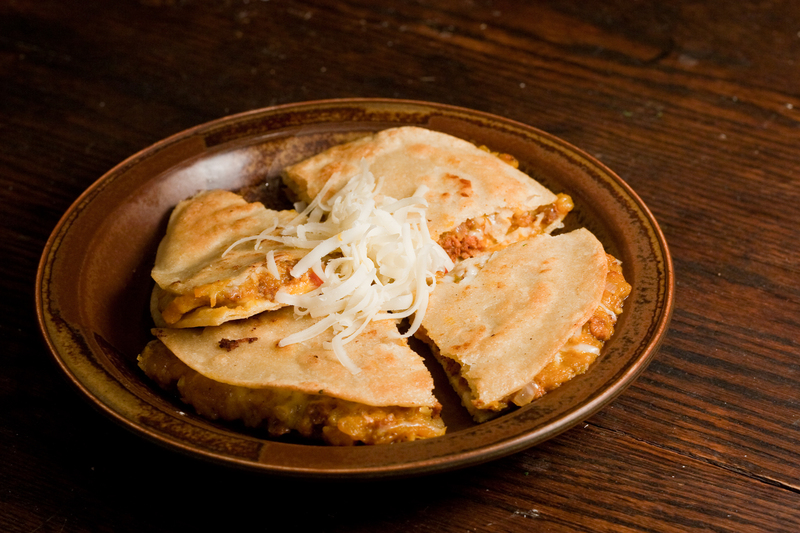 *A pizza cutter is the best way to slice quesadillas. A knife pushes all the filling out. *For squash puree, split and roast squash, cut side down, on a baking sheet, at 400 degrees. When flesh can be easily pierced with a roasting fork, like soft butter, it is done. Let cool, scrape pumpkin from skins and mash. **I still can’t get enough of this vinegar from Sapore. 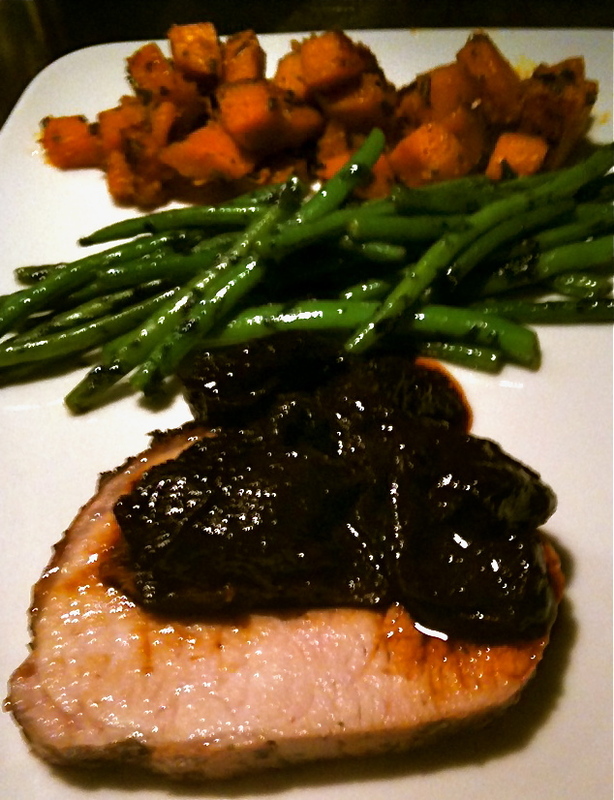 You can substitute sherry vinegar and 1/2 tsp honey. Heat 1 tablespoon olive oil in a 12″ skillet at medium. Remove casings from chorizo and brown meat, crumbling a it cooks. Remove meat with a slotted spoon when fully cooked. Add oil, if needed, to make up 2 tbs fat in the pan, and sauté onion. When onion is soft, add squash purée and heat through. Season with paprika, Serrano Chile Honey vinegar, salt and pepper. Mix sausage into squash. Assemble quesadillas on top of 1 tortilla, layering cheese, squash mixture, diced tomato and finally topping with more cheese and a second tortilla. Cook quesadillas over medium heat, lightly browning both sides. Slice and serve. What I haven’t cooked yet. Two weeks ago, Dave and Valerie from Sunnyside Farm gave me a Cinderella pumpkin, saying, “We bet you haven’t cooked this yet.” They were right. I’ve cooked Blue Hubbards, warty Peanut pumpkins and dark-green, lumpy, Italian Marina de Chioggia. But I had never cooked a Cinderella pumpkin. The first thing I wanted to know was how it tasted. Grey and oblong, Blue Hubbards are sweet and rich. If you want classic pumpkin, for pie or soup, Hubbard is the squash for you. 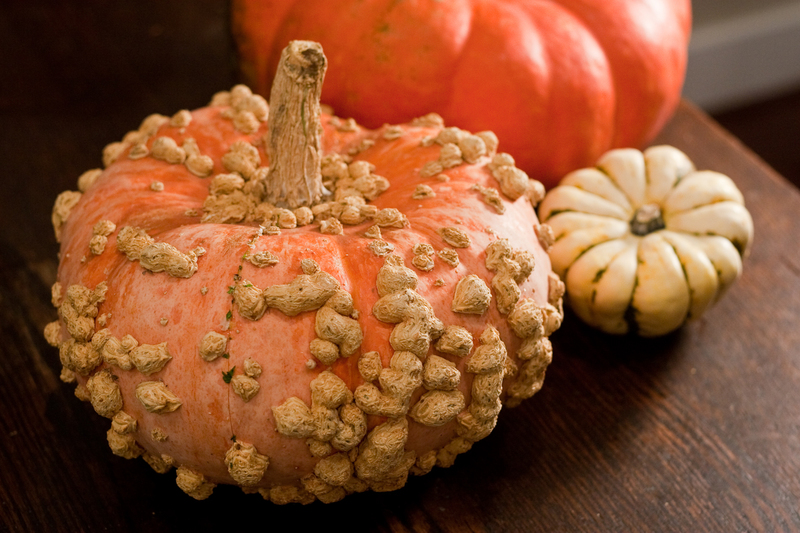 Peanut pumpkins, also know by their French name, Galeux d’Eysines, is mild and sugary. The “peanuts” are the result of sugars building up under the skin. Chioggia, on the Adriatic coast of Italy, is known for its candy-striped beets and it’s namesake pumpkin. Sweet, rich, drier and dense, it is the pumpkin of choice for gnocchi. 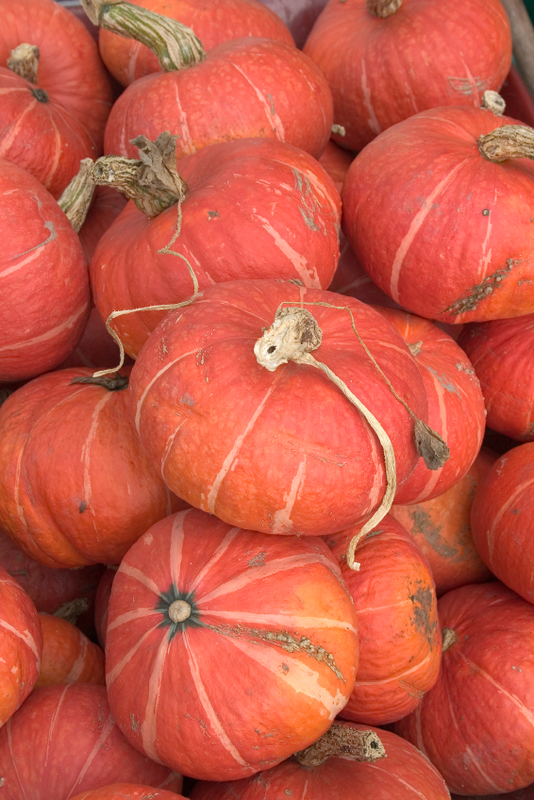 The Cinderella pumpkin, red and flat, is a French heirloom also known as Rouge vif D’Etampes. It is likely the pumpkin the Pilgrims and Wampanoags served at the first Thanksgiving. It is mild and not particularly sugary. It cooks down into a beautiful bright orange purée. Tasting more like dinner than dessert, I began to think of Asian flavors and dumplings. Light Tamari soy, sweet palm sugar and rich, toasted sesame oil delivered the asian flavor profile. Purchased gyoza skins were a valuable shortcut for wrapping the dumplings. Riffing on sweet chile sauce (thanks Renee! ), we combines Merken Chile Oil, Tropical Spice Vinegar, Lancaster County honey for sweetness and red miso paste for depth. 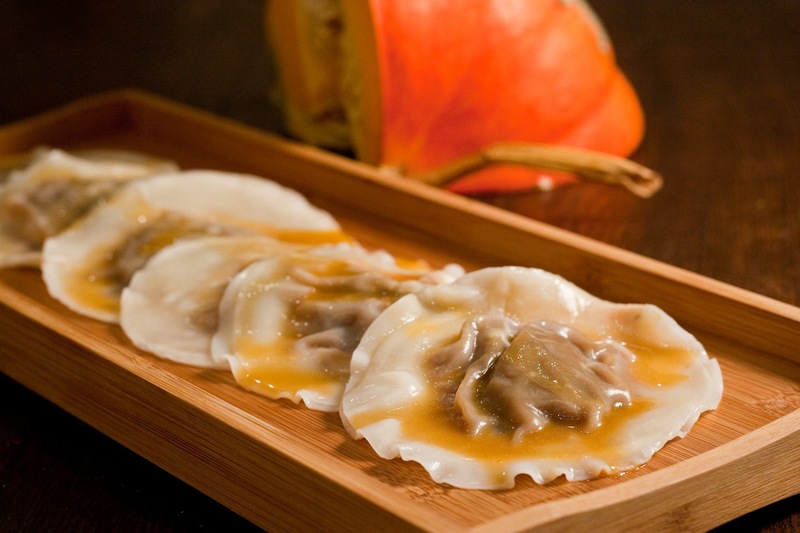 The satiny texture and rich color of the sauce paired beautifully with the cooked dumplings. And now I’ve cooked a Cinderella pumpkin. Makes 15-18 full dumplings or 25-30 half dumplings. 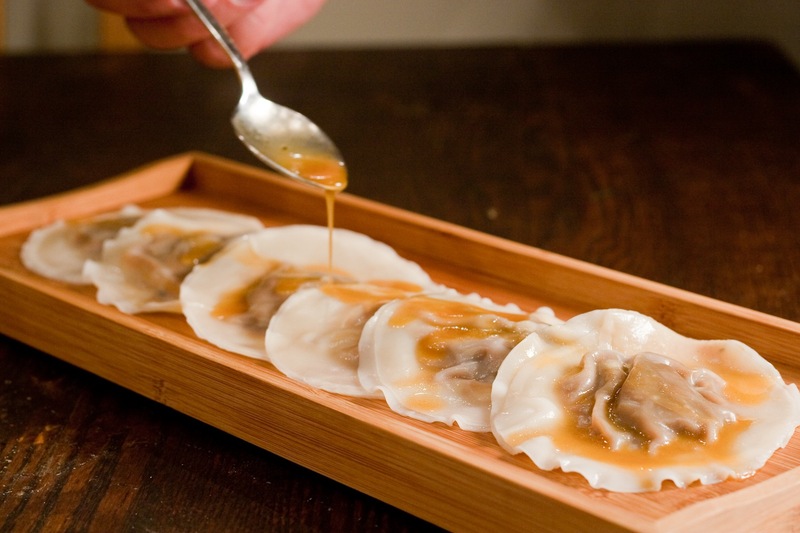 1 package round gyoza skins, thawed or 1 package of square wonton skins, cut round with a biscuit cutter. *To cook your pumpkin, scroll to the bottom of the directions. **I’ve been shopping at Sapore again. Substitute Sherry vinegar for the Serrano-Chile Honey. Use a chile infused olive oil for the Merken and add white wine vinegar with a pinch of sugar in place of the Tropical Spice. 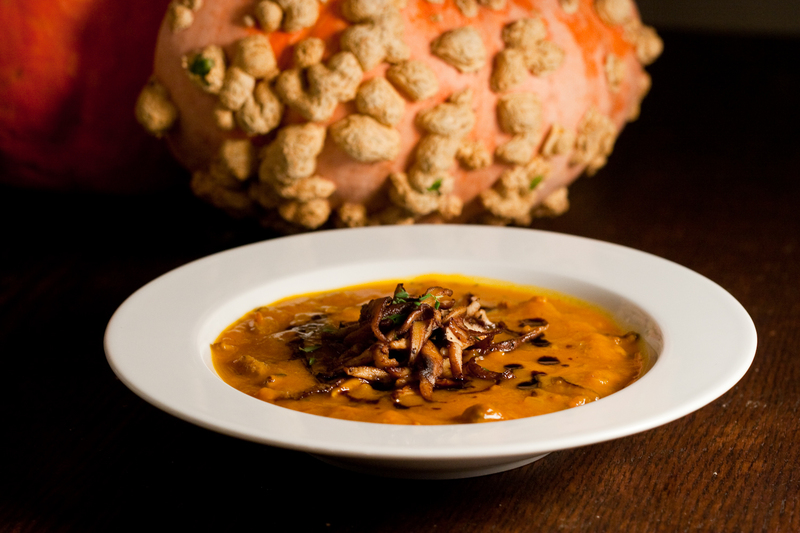 Combine pumpkin purée with palm sugar, soy, sesame oil, ginger and Serrano Chile Honey Vinegar. Season to taste with a pinch of salt. Wet the edges of two gyoza skins or wonton wrappers. Place a teaspoon of filling in the middle of one wrapper. Cover with second wrapper with wet sides faceing. Press together pushing out air. Cut around the filling with a biscuit cutter leaving 1/4” of wrapper outside the filling. Place on a baking sheet lined with parchment. OR place a scant teaspoon of filling in the middle of a gyoza skin, wet the edges and fold in half, pressing out the air and making sure the dough seals all the way around without filling squeezing through. Place on a baking sheet lined with parchment. Boil dumplings for 3-4 minutes, about 1 minute after they float to the surface. Whisk together sauce ingredients and serve over cooked dumplings. Cut your pumpkin in quarters. Rub inside with olive or vegetable oil and roast at 400F until the flesh can be easily pierced, through to the skin, with a fork. Remove from oven, let cool, and scrape pumpkin flesh from the skin. Quarter your pumpkin and scoop out the seeds. Peel the skin with a vegetable peeler or knife. Cut into a 1/2″ dice. Warm 2 tbs olive oil in a large pan or 6qt soup pot, Cook until pieces begin to brown on edges, add 1/4 water at a time until pumpkin cooks down into a smooth puree, mashing as it softens. I’m still wearing white shoes. *Sincere thanks to Jenny Lehman for this beautiful photo of the soup she made at home from this recipe. Spring and fall in Washington easily compensate for summer’s most humid days and the city’s damp, insipid attempt at winter. One of the great joys of these seasons is their length. In New England, where I grew up, spring announces itself with a six-week flurry of daffodils, Forsythia and Rhododendron that fade as quickly as they arrive. DC’s season’s last months, lingering over spring flowers and the long change to autumn, marked by crisp leaves, bright mums and jaunty scarves and caps. Why force it then? I’m puzzled by the appearance of pants and sweaters on the first 75 degree day in September while I’m still enjoying the end of summer in shorts and a tee. I feel the same way about food. 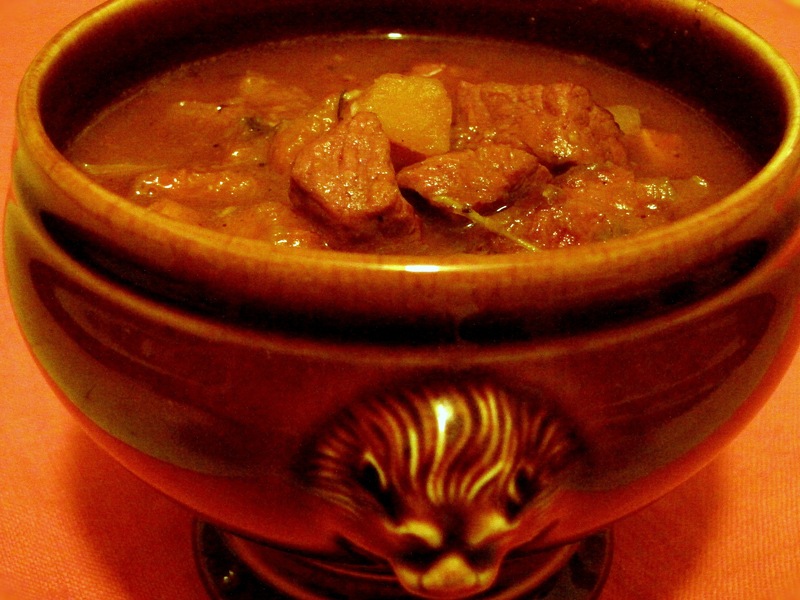 Hearty soups are inappropriate on a warm, humid day no matter what date the calendar marks. 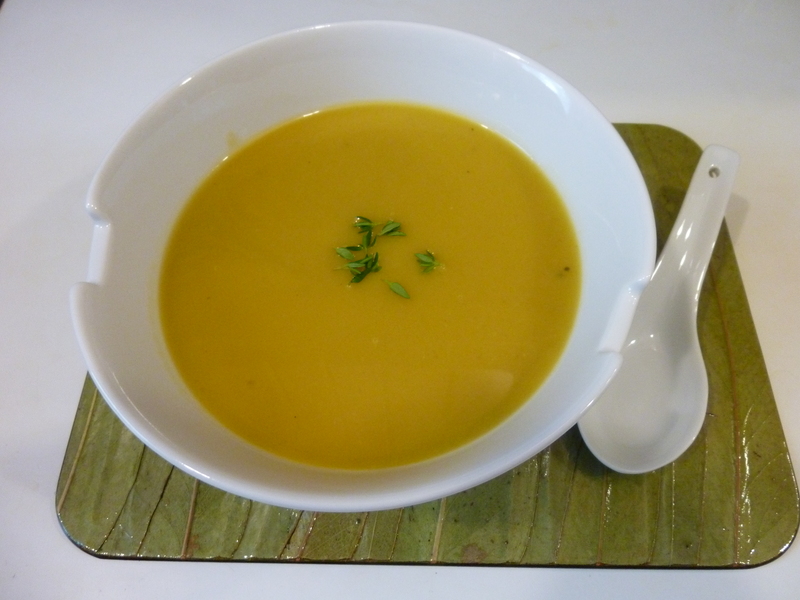 Presented with the year’s first Delicata squash, I wanted to serve up a soup that was light and celebrated this cultivar’s sweet, floral notes*, saving rich, sugary Hubbards and Kabocha’s for colder weather. A double stock, flavored with anise-y fennel, the season’s last tomatoes and earthy Shitakes bring out the lighter notes in Delicata. Using the seed mass beefs up the squash taste. This soup delivers so many layers of flavor, for so little work, the first bite caught me by surprise. Farm-fresh butter adds welcome richness. In a rare decision, we left out vinegar. Even rich balsamic dulled Delicata’s delicate sugars. *”Seriously, floral notes and light sweetness? Next you’ll be telling me about lingonberry accents in my Pinot.” My parents and I actually conducted a squash tasting at home one night. That’s just how we roll. 4 Delicata squash, peeled, seeded and cut in 1” cubes. Seed mass reserved. While you chop the squash and onions, simmer the vegetable stock with fennel, tomatoes, mushrooms, herbs and bay leaves for 20-30 minutes. Warm oil in a 4qt soup pot over medium heat. Add onion and sauté until translucent. Add garlic and cook one minute until fragrant. Add squash and sauté 5-7 minutes. Strain the stock into the vegetables and cook until squash is easily pierced through with a fork or tip of a knife. Purée soup in a food mill or with an immersion blender. I prefer a food mill for this soup because of the smoother purée it produces. Season to taste with butter, salt and pepper. My husband, Jason, first met my extended family at my sister’s wedding. My mom is one of seven, all married with children.My dad is one of three. In total, there were more than 50 family members present. I love Jason’s retelling of this first meeting. So, it shouldn’t surprise you then, that when my happy family gets together, conducting a squash tasting seems perfectly normal. This is exactly what Mom, Dad and I did last fall after visiting the local farmers market. We took four squashes – Buttercup, Ambercup, Delicata and Sweet Dumpling – roasted them with thyme and olive oil and compared. 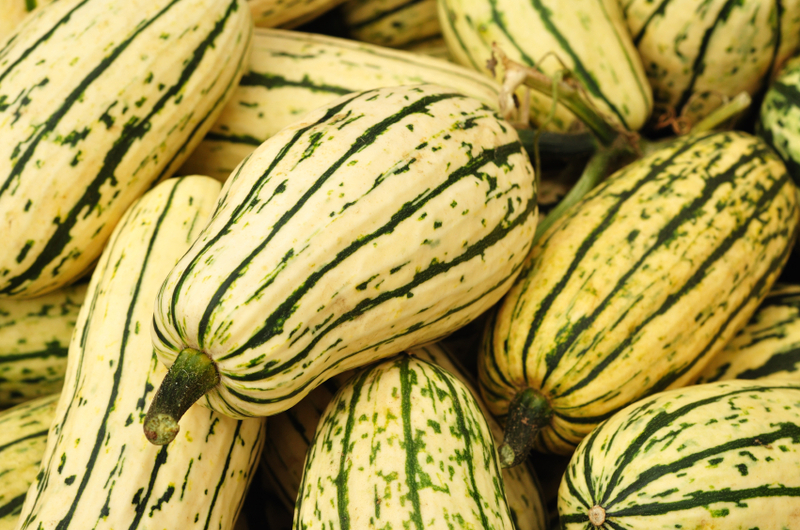 Delicata was the clear favorite: sweet, mild, firm and smooth textured*. 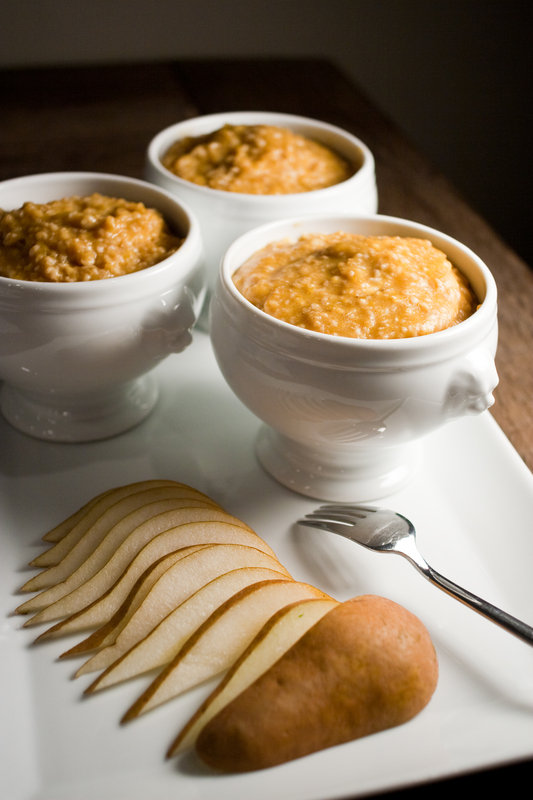 It is also the perfect squash for this recipe. Easy to peel, Delicata is perfect for breaking down to a 1/2″ dice. It’s light, sweetness balances beautifully with the cider glaze, mellow herbs and brightened with a splash of Sherry vinegar. It is tender enough to cook in just about 15-20 minutes. How good is this recipe? I made it last week for dinner guests. Our friend Gerry pulled me aside before dinner and said, “Don’t be offended if I skip the squash. You really don’t want me to eat it unless you want to see me throw it back up. I hate squash.” After dinner, with a glint in his eye, he said, “I admit it. I tried a bite. It was delicious!” I was glad. Throwing up at the table would have really killed the mood. *Buttercup was our second favorite. Richer, but still mild and sweet. Ambercup could be easily mistaken for sweet potatoes. Sweet Dumpling was similar to Delicata. It’s a reasonable substitute in a pinch, but grab Delicata if you can find it. Heat a 12” sauté pan over medium heat. Melt butter in pan. Add squash, and sauté 3-5 minutes, browning the squash lightly. Add cider, bring to a simmer and reduce heat and cook uncovered. As the squash cooks, the cider will reduce to a glaze. Add additional water, 1/4 cup at a time, if squash needs more cooking time. Season to taste with salt, pepper and a splash of Sherry vinegar.